I love me a Thursday. The weekend is so close, I can just feel it! I hope you are all having a great week! Something about this confession feels a little dirty. I am currently OBSESSED with Lean Cuisines. I don't know why I feel so guilty about this? I think just because we all know that I love to cook, and eating Lean Cuisines just feels like cheating! But, at this point, if Lean Cuisines are wrong, I don't wanna be right. I have to admit that I used to kind of judge people who brought lean cuisines for lunch. I thought...how lazy! Does that really fill them up?? I'm not sure how it all started. It was like some devious force pulled me over to the frozen foods section and whispered in my ear that my whole week's lunch was right in front of me at the great low price of $2.00 a box (they were on SALE!). So, I picked up a couple of boxes. A little dabbling with the dark side can't hurt, right? I rotated them in with my usual lunches of leftovers from dinner or homemade salads. Then, slowly, I started picking up some more of these little boxes. I started thinking to myself..."damn, these are actually pretty good!" I cut down my morning routine by 5 precious minutes because all I had to do was grab a little box out of my freezer and throw it in my lunch bag. Done and done!! Also, I have to say that I think these Lean Cuisines are actually having a positive effect on my waistline. Who knew?!? I would credit this to the fact that the meals are perfectly portioned and portion-control when packing leftovers probably isn't my strong suit. One other thing I love is that, as I mentioned before, I have been using MyFitnessPal. These things all pop up INSTANTLY on that app. We're talking every single stinking meal - it's there! I bought this one because it reminded me of Applebee's Fiesta Lime Chicken (yum!). This tastes like Chinese food delivery to your desk. Spinach. Artichoke. Sign me up. Reminds me of Pad Thai. These are great. Don't over-cook them or they get tough. So, that's my latest life hack. I am praying I don't get sick of these meals, because they are constantly on sale at my grocery store and they are making my life so dang simple. 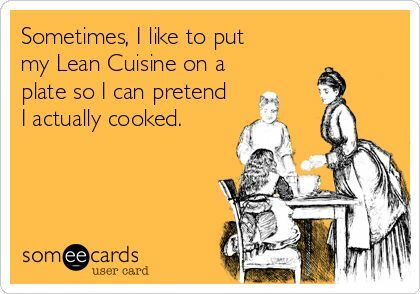 Do you have any favorite Lean Cuisines?? Tell me your secrets!! The potstickers and sesame chicken are two of my favorites! I also love the tortilla-crusted fish...it's probably not work-friendly because of the smell, though. You're probably right, fish might not be appreciated at the office :) I will have to try that one at home though because it does sound good! I also like the Tortilla Crusted Fish, and I'm not even a fish person. I also like the Four Cheese Cannelloni, although I usually need a side salad to get filled up with that one. And I can't believe it, but I love the spaghetti and meatballs. My other favorite micro meal is Smart Ones Three Cheese Ziti. If you want a non-healthy splurge micro meal, Amy's CHEESE Enchilada meal with corn and black beans on the side is a glorious, greasy mess. I'm from San Antonio and tend to be a snob when it comes to enchiladas, but hers is just as good as any I've had from home.